As an award show, the televised portion of the 55th annual Grammy Awards lived up to its name in several ways by showcasing some major accomplishments to a wide (albeit comparatively lower) viewership on Feb. 10. 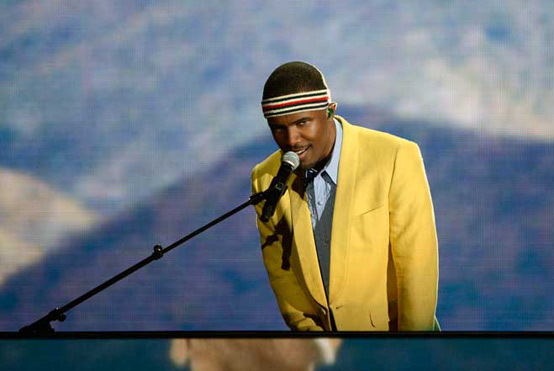 Although they continued to glorify Chris Brown with an award nomination, a seat at the show, and several cuts to his reactions throughout the night, the Grammys denied the woman beater and accused parole violator further celebration in his nominated categories, instead awarding Best Urban Contemporary Album to Frank Ocean, who Brown allegedly jumped in a parking lot on Jan. 27. Taylor Swift kicked off the night’s ceremonies with her holier-than-thou anthem “We Are Never Ever Getting Back Together” but was ultimately snubbed for an award – great retribution after a performance that included a modified na-na na-na boo-boo spoken portion where Swift relished in the fact that she’s too “busy opening up the Grammys” to speak with an ex, as well as an extra emphasized rendition of the song’s aping of its subject’s preference for “some indie record that’s much cooler than” the singer’s (a now tired and platitudinized criticism of so-called hipsterism and ultimately a slap in the face to the musicians that made it to the awards without riding there on the coattails of major labels). While this year’s award presentation took some major strides, the cold shoulder it offered rap artists in major, universal categories such as Record of the Year, Album of the Year, Song of the Year, and Best New Artist continued a long history of snubbing that transpires like the course of a record that is very broken, and definitely not one that is scratched in intentionally rhythmic and musically interesting ways. The perpetuation of that history lends credence to criticism that the Grammys are institutionally racist. That’s not to say that musicians working within the rap genre represent all black artists or “black music,” or that the Grammys ignores the contributions of black performers. The Grammys introduced rap award categories in 1989 that have since changed, black musicians/performers have been acknowledged for success in Grammy award categories outside of rap, and artists that have not been black have been nominated in rap categories. What is concerning about Grammy Award handlings of the rap categories and black performers is that where it has honoured black performers operating outside of the genre, it has typically been for music with features generally recognized as typical of or more popularly practiced by contemporary white musicians (e.g. the singing typical of R&B performances), and its failure to represent excellence on a general scale for music typically performed by black contemporary artists. An exclusion of rap music from nominations in the larger general categories was made particularly questionable this year, after Jay-Z and Kanye West took away several prizes for two songs off of their Watch the Throne – the Best Rap/Sung Collaboration category for “No Church in the Wild” and Best Rap Song and Best Rap Performance for “N****s in Paris” – but failed to receive nominations in broader categories as an album that enjoyed massive critical and commercial success around the world. To their merit, this year’s Grammy’s did include an end of program rap rock performance featuring a collaboration between evening host LL Cool J, Chuck D (Public Enemy), Tom Morello (Rage Against the Machine, The Nightwatchman), DJ Z-Trip, and Travis Barker (Blink 182, Transplants, etc.). But the treatment of that performance lent itself as yet another suggestion of the program’s ultimate priorities when the audio and visuals were interrupted and covered over with credits and sponsor messages throughout. Viewership is also known to drop as the event goes later into the night. This entry was posted in Burden of Salt and tagged Black performers. Grammys, Blink 182, Chris Brown, DJ Z-Trip, Jay-Z, Kanye West, No Church In the Wild, racism, Rage Against the Machine, Taylor Swift, The Nightwatchmen, Tom Morello, Transplants, Travis Barker on February 14, 2013 by Tom Beedham.